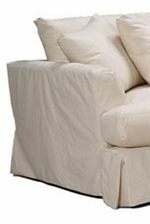 Coordinating with casual conversation rooms and sunny upholstered sitting areas, this slipcover chair and a half and ottoman set is a popular home furniture piece for its large comfortable seating area as well as its American made construction and the attention to detail that creates its high-quality elegance. Bench made in Hickory, North Carolina, this casual furniture set features a certified sustainable kiln-dried hardwood frame that has been reinforced for strength and durability while a Flexolater Spring System ensures seated comfort with a reduction in metal squeaks. A seat cushion made from multilayer soy or plant-based polyfoam wrapped in fiber-down blend and encased in downproof ticking creates a comfortable sitting experience that is tailored to relaxation. Complete with a kick style skirt and contemporary flared arms, this large chair and ottoman are available as a set as well as sold separately. The 0778 Slipcover Chair and a Half and Ottoman Set with Casual Pleated Skirt by McCreary Modern at AHFA in the area. Product availability may vary. Contact us for the most current availability on this product. Seat Plush Upholstered T-Style Seat Cushion on Chair with Smooth Flowing Appearance. Plush Upholstered Footrest Seat Cushion on Ottoman.